Rituximab is a widely used B-cell-depleting monoclonal antibody. It is unlicensed for use in neurological disorders and there are no treatment guidelines. However, as a rapidly acting, targeted therapy with growing evidence of efficacy and tolerability in several neuroinflammatory disorders, it is an attractive alternative to conventional immunomodulatory medications. This practical review aims to explain the basic principles of B-cell depletion with therapeutic monoclonal antibodies. We present the evidence for using rituximab in neurological diseases, and describe the practical aspects of prescribing, including dosing, monitoring, safety, treatment failure and its use in special circumstances such as coexisting viral hepatitis, pregnancy and lactation. We provide an administration guide, checklist and patient information leaflet, which can be adapted for local use. 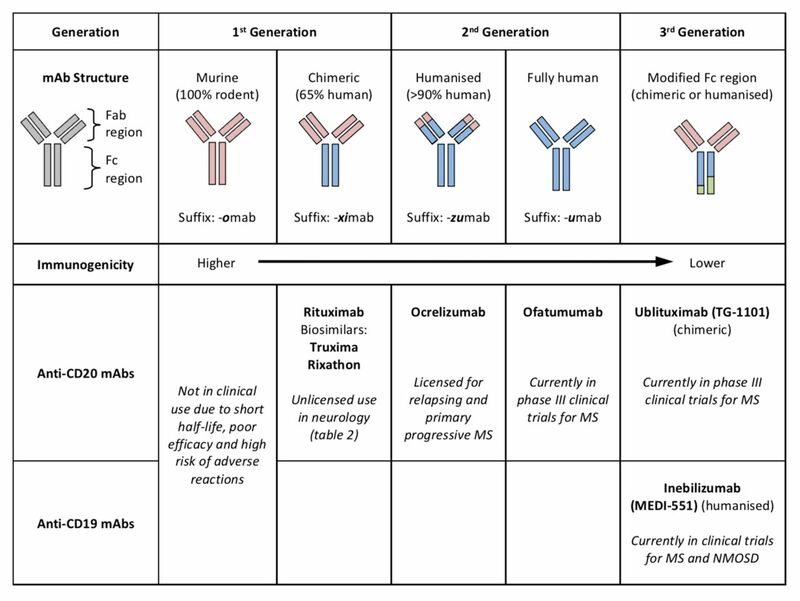 Finally, we review the safety data of rituximab and ocrelizumab (a newer and recently licensed B-cell-depleting therapy for multiple sclerosis) and suggest monitoring and risk reduction strategies. This article covers both the practical aspects of prescribing rituximab and some of the basic principles of B-cell depletion with monoclonal antibodies, which are relevant to neurologists. Those seeking an administration guide for rituximab, or a rapid overview of the indications and supporting evidence, expected side-effects or specific prescribing circumstances, should skip to the relevant tables towards the end of the article. We have provided an example of a patient information sheet and an administration checklist, which are available as online supplementary material 1 and 2. Serious or recurrent (particularly respiratory) infections. Total serum IgG <6.0 g/L (recurrent infection is more likely if IgG <4.0 g/L). Liaise with local immunology service. Check disease-specific circulating antibody titres against Haemophilus influenzae (Hib), Clostridium tetani and pneumococcal capsular polysaccharide. If titres are below protective cut-off levels (Hib >1 mcg/mL, tetanus >0.1 IU/mL, pneumococcus >50 mg/L), 90 vaccinate patients and retest titres after 6 weeks. – Initiate intravenous immunoglobulin at 0.4–0.6 g/kg/month or consider subcutaneous formulations. – Aim for serum IgG within normal range (6–16 g/L). Assess clinical response to IGRT after 6 months (burden of infections) and consider the need for long-term treatment. IGRT is unlikely to reduce the frequency of urinary tract infections. B-cells secrete antibodies, present antigen and regulate the immune response by producing proinflammatory and anti-inflammatory cytokines. Only 2.5% of the total B-cell population is within the peripheral circulation, made up predominantly of naïve mature B-cells and memory B-cells; the rest are in bone marrow and lymphoid tissue.1 Antibodies may be of any immunoglobulin class (G, M, A, D or E) or subclass (eg, IgG1–4), each of which have differing functions. Examples of disorders in which autoantibodies are almost certainly pathogenic include myasthenia gravis with acetylcholine receptor (AChR) antibodies (usually IgG1 or IgG3) or muscle-specific tyrosine kinase (MuSK) antibodies (IgG4), neuromyelitis optica spectrum disorders (NMOSD) with antibodies against the aquaporin-4 water channel (mainly IgG1), and autoimmune encephalitis with antibodies to the N-methyl-D-aspartate receptor (NMDAR) (mainly IgG1) or leucine-rich glioma inactivated-1 (LGI1) (mainly IgG4). B-cells also play a crucial role in multiple sclerosis (MS) pathogenesis, evidenced by cerebrospinal fluid oligoclonal IgG bands, meningeal-based ectopic B-cell follicles adjacent to areas of focal cortical demyelination2 and the efficacy of B-cell-depleting therapies to treat MS.
CD19 and CD20 are B-cell transmembrane proteins. They can be used as targets for drugs and as surface markers (in flow cytometry to quantify B-cell populations and assess treatment response). CD19 is expressed more widely throughout B-cell development than CD20 but both markers are absent on long-lived plasma cells (figure 1). In healthy adults CD19+ or CD20+ B-cells comprise 12%–22% of the total circulating lymphocyte population (absolute reference range is 50–500 cells/mm3). Stages of B-cell development and expression of B-cell surface markers. Pluripotent haematopoietic stem cells develop into naïve mature B cells in the bone marrow. They then migrate to secondary lymphoid organs (spleen and lymph nodes), where they are activated by antigens in circulating lymph and mature into memory B-cells or plasmablasts. 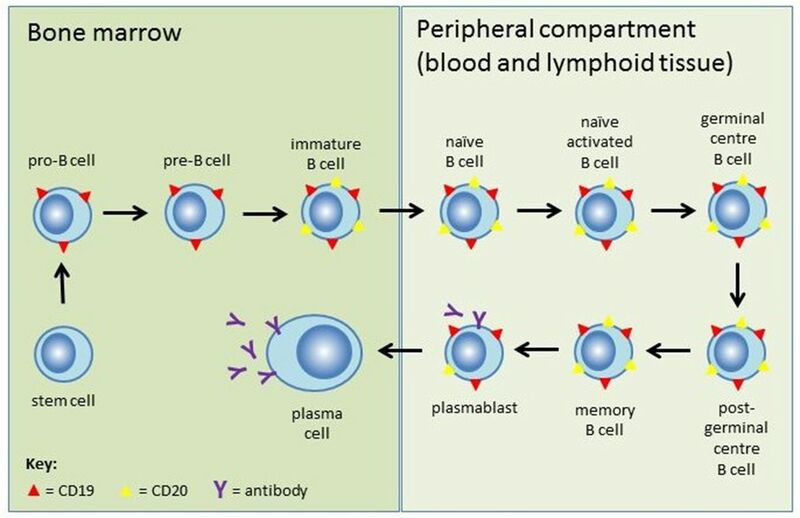 Memory B-cells either circulate in the bloodstream or remain in germinal centres, while plasmablasts mature to antibody-secreting plasma cells that reside in the bone marrow or lymphoid tissue. CD20 (yellow triangles) appears at the immature B-cell stage and is lost at the plasmablast stage. Most plasmablasts and nearly all plasma cells (which produce the vast majority of antibodies) do not express CD20. CD19 (red triangles) has wider expression from the pro-B-cell stage through to plasmablasts and a proportion of plasma cells, but not terminally differentiated plasma cells. Monoclonal antibodies are immunoglobulins produced by a single clone of hybridoma cells (antigen-specific plasma cells fused with myeloma cells). They bind via their two identical fragment antigen binding (Fab) domains to a single epitope and activate the immune system via their fragment crystallisable (Fc) domain. Cells expressing that epitope are killed, therefore allowing highly targeted immunotherapy for a variety of neoplastic and autoimmune diseases. Available B-cell-depleting monoclonal antibodies have Fab domains targeted to CD20 or CD19, and so selectively deplete the circulating B-cell population, with the exception of mature antibody-secreting plasma cells. figure 2 shows those used in treating neuroinflammatory diseases. B-cell-depleting monoclonal antibodies in neurology. mAb, monoclonal antibody; MS, multiple sclerosis; NMOSD, neuromyelitis optica spectrum disorder. Rituximab was the first anti-CD20 monoclonal antibody to be approved (1997) for treating B-cell lymphomas. It has since been licensed to treat refractory rheumatoid arthritis and antineutrophil cytoplasmic antibody (ANCA)-associated vasculitis. Unlicensed use for neuroinflammatory disease is growing. Rituximab is a first-generation, chimeric monoclonal antibody made by fusing a murine (rodent) Fab domain with a human Fc domain (‘chimeric’ is from the mythological Chimera—a monstrous fire-breathing hybrid creature, part lion and part goat). The Fc domain activates various immune mechanisms, as shown in figure 3. Ninety per cent of circulating B-cells are killed within 3 days of the first infusion of rituximab. Reduction of pathogenic antibody titres correlates with efficacy in some disorders. However, rituximab probably affects the whole spectrum of B-cell function, and secondary changes in T-cell function, such as induction of immunoregulatory T cells, may be important in some neuroinflammatory disorders. Sparing of CD20negative long-lived plasma cells is hoped to preserve lasting humoral immunity. 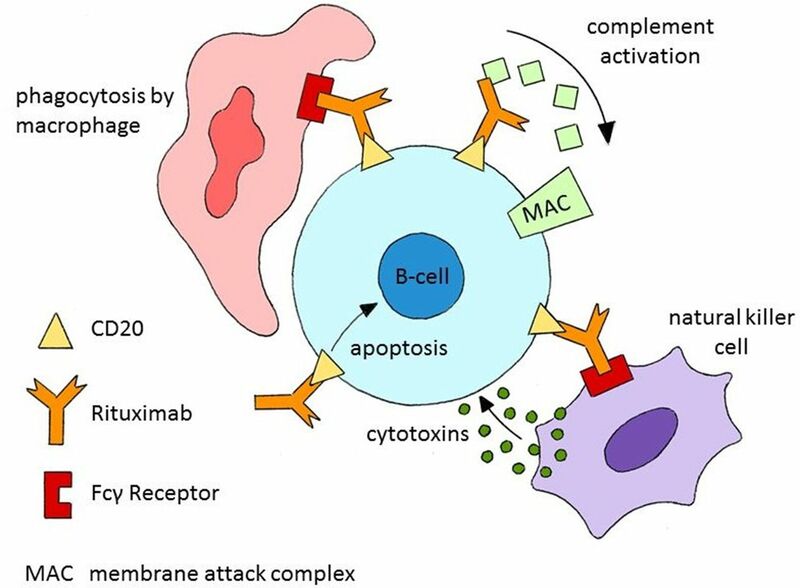 Rituximab depletes CD20+ B-cells via three different mechanisms: (1) antibody-dependent cellular cytotoxicity mediated by Fcγ receptors on the surface of natural killer cells, granulocytes and macrophages; (2) complement-dependent cytotoxicity; (3) induction of apoptosis. Compared with first-generation monoclonal antibodies, second-generation monoclonal antibodies have improved Fab domains, often humanised or fully human, which improve B-cell killing and tolerability (figure 2). Ocrelizumab (humanised) was recently approved to treat relapsing and progressive MS. Ofatumumab, a fully human monoclonal antibody given by once monthly subcutaneous injection, is in clinical trials. Third-generation monoclonal antibodies have been further engineered to improve their Fc-mediated immune functions or half-life. Ublituximab (TG-1101), a rapidly infusible chimeric glycoengineered monoclonal antibody, is also being trialled in MS currently. Most monoclonal antibodies are costly. However, once the original drug patent expires, cheaper, copy versions—‘biosimilars’—become available. Competing companies do not have access to the original molecular clone, cell bank or exact manufacturing process, which may result in slight differences to these complex molecular structures. Therefore, biosimilars are not truly ‘generic’. To gain a licence, biosimilars must be shown to be highly similar in structure, purity and biological activity to the original monoclonal antibody; however, it is not necessary to repeat clinical trials for each indication. Rituximab’s patent expired in 2016 and the European Medicines Agency (EMA) has approved two biosimilars, Truxima and Rixathon. The dosing and administration protocols are identical. British National Formulary prices are currently £1746 for MabThera 1 g (the original form of rituximab) vs £1572 for Truxima or Rixathon.6 However, prices to National Health Service (NHS) hospitals vary substantially according to regional contracts and discussion with the hospital pharmacy department is advised. Patients should be informed of the switch and monitored to ensure that tolerability and side effects remain unchanged. An understanding of the evidence for rituximab in neuroinflammatory disorders (see table 1 for a briefer summary) should inform off-license prescribing. With a choice of licensed disease-modifying therapies supported by phase III randomised controlled trials, use of rituximab in the UK for MS is rare. However, there is evidence suggesting efficacy, and it may be an option in occasional cases (especially if licensed comorbidities, such as active rheumatoid arthritis, facilitate funding). Phase I and II trials of rituximab in relapsing–remitting MS met their primary endpoints.7–9 A large 96-week multicentre randomised controlled trial in primary progressive MS failed to demonstrate a delay to confirmed disease progression, but subgroup analysis showed a benefit in younger patients, particularly with inflammatory lesions.10 Trials in MS then ceased, probably due to the impending expiration of rituximab’s patent and the emergence of newer B-cell-depleting therapies from the same manufacturer. Sweden is the biggest off-licence prescriber of rituximab for all forms of MS and has published class IV evidence of safety and efficacy in a large multicentre cohort (n=822).11 The dose used is 500–1000 mg 6–12 monthly. A recent real-world retrospective comparative study showed efficacy in relapsing–remitting MS comparable to natalizumab and fingolimod, and significantly better than injectable disease-modifying therapies and dimethyl fumarate. Rituximab was superior to all drugs in terms of discontinuation rate.12 Although this is relatively low-quality evidence, there is a clear indication that rituximab is an effective treatment for MS, which would be expected in light of the recent positive randomised controlled trials for ocrelizumab. No immunosuppressive therapy in NMOSD is yet validated by a high-quality randomised controlled trial, though there are three such trials ongoing. Rituximab use is supported by numerous, predominantly retrospective, case series amounting to over 400 patients and showing consistent reductions in annualised relapse rate. There are various dosing strategies in use, which we discuss later in ‘dosing and monitoring’. A recent meta-analysis calculated a mean reduction in relapse rate of 79%.13 As such, rituximab currently has the best evidence of any immunotherapy used in NMOSD, but due to its relatively high cost, it remains second-line therapy for patients in the UK. It is available for patients who have relapsed despite adequate treatment with azathioprine or mycophenolate mofetil combined with low-dose prednisolone.14 Funding can be obtained through the Specialised NHS England Service for NMOSD (www.nmouk.nhs.uk). Evidence for autoimmune encephalitis with less common antibodies is limited to case reports and small case series, which are frequently confounded by coadministration of multiple immunotherapies. For example, there are two case series reporting outcomes after rituximab in seven patients with anti-LGI1 encephalitis. Three patients (43%) had good outcomes and one patient had a possible response.19 20 The emerging theme in autoimmune encephalitis, irrespective of antibody status, is that early and aggressive immunotherapy is beneficial. It seems plausible that rituximab, or similar B-cell-depleting therapies, will increasingly form part of immunotherapy algorithms. A UK clinical commissioning policy, published in December 2017, reviewed the evidence for rituximab to treat chronic inflammatory demyelinating polyradiculoneuropathy (CIDP), multifocal motor neuropathy, non-systemic vasculitic neuropathy and IgM paraprotein-associated demyelinating neuropathy with antibodies to myelin-associated glycoprotein (anti-MAG neuropathy). It concluded that there is insufficient evidence to make rituximab routinely available for these disorders.33 However, there may be circumstances in which rituximab could help, as discussed below. Most studies have used 375 mg/m2 weekly for 4 weeks. International consensus guidelines (2016) advise that ‘rituximab should be considered as an early therapeutic option in patients with MuSK-associated myasthenia gravis who have an unsatisfactory response to initial immunotherapy.’51 A formal consensus could not be reached for AChR-associated myasthenia gravis. Several predominantly retrospective, observational studies and two systematic reviews have investigated rituximab as an acute therapy (usually a single course with variable dosing) for refractory myasthenia gravis (persistent weakness or need for high-dose corticosteroids despite conventional immunosuppression). Despite many case series being shared between the systematic reviews, the reported response rates in AChR-associated myasthenia gravis are discordant, with 30%–80% of patients achieving a Myasthenia Gravis Foundation of America post-intervention status (MGFA-PIS) of ‘minimal manifestations or better’ following rituximab.52 53 This may be explained by variability in patient selection, inclusion of many ‘burnt out’, unresponsive cases and inclusion of cases where MGFA-PIS was not used as an outcome measure in the original report. Response did not correlate well with AChR antibody titres.53 Two ongoing randomised controlled trials may help better define the efficacy of rituximab in AChR-associated myasthenia gravis in the near future. 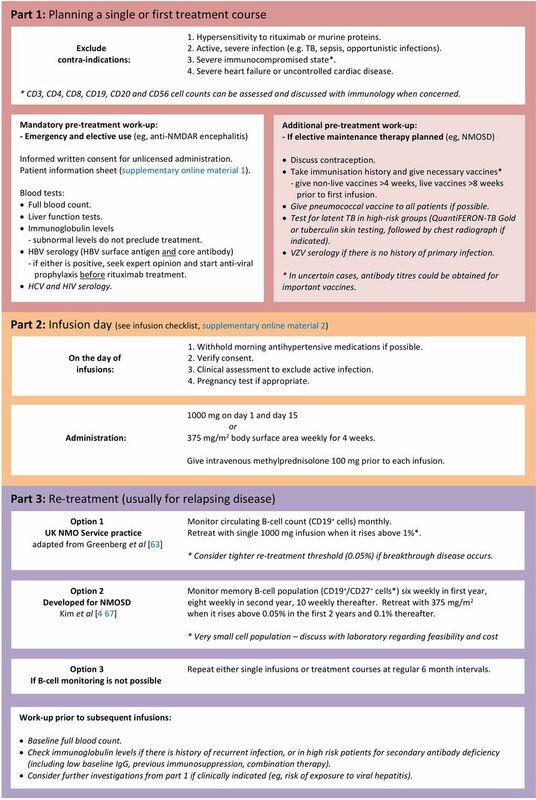 Rituximab administration guide. Italicisedpoints reflect our personal practice rather than established recommendations. HBV, hepatitis B virus; HCV, hepatitis C virus; HIV, human immunodeficiency virus; NMDAR, N-methyl-D-aspartate receptor; NMOSD, neuromyelitis optica spectrum disorders; TB, tuberculosis; VZV, varicella zoster virus. Near complete B-cell depletion occurs within a fortnight of infusion and usually persists for 6–12 months. Therefore, where maintenance treatment is planned, repeated courses have commonly been given at regular six monthly intervals. However, patients vary significantly in both the initial rituximab dose required to achieve B-cell depletion and the time to B-cell repopulation. In a study of patients with NMOSD, 17% repopulated their B-cells before 6 months.63 Prolonged B-cell depletion lasting over 3 years following a single dose of rituximab is also reported.64 This makes a case for monitoring and retreating according to B-cell repopulation, which will identify ‘early repopulators’ at risk of disease relapse, and limit overtreatment of patients with sustained B-cell depletion, thereby preventing complications and reducing cost. Although rituximab is an anti-CD20 antibody, quantification of CD19+ cells using flow cytometry is the preferred method for monitoring B-cell depletion and repopulation. This is because rituximab still present in serum could block binding of fluorophore-labelled anti-CD20 antibodies used in flow cytometry, thereby interfering with the detection of B-cells. Among the several relapsing illnesses that may benefit from rituximab, relapses from NMOSD pose the highest risk of permanent disability. However, the critical threshold of B-cells in the measurable peripheral circulation that is associated with NMOSD relapse is undetermined and is likely to vary with the disease and individual. Neurologists have retreated when the CD19+ B-cell count becomes detectable65 or more than 0.1% of total circulating lymphocyte count.66 Some measure the much smaller memory B-cell (CD19+/CD27+) population (see figure 4 —option 2).4 67 Switching from six monthly infusions to memory B-cell-monitored treatment reduces cumulative rituximab dose without apparent loss of efficacy.68 However, standardisation of flow cytometry techniques and inaccuracy when quantifying very small cell populations can pose problems.69 In the UK NMO Service we use monthly CD19+ B-cell monitoring and have found 1% (an arbitrary value based on clinician experience) to be an acceptable cut-off for retreatment for the majority of patients.70 In those who relapse with a detectable B-cell count below 1%, retreatment aiming for complete suppression is suggested before considering treatment failure and switching immunotherapy. In a large NMOSD cohort (n=100), nine patients (9%) experienced relapses despite CD19+/CD27+ memory B-cell depletion within target range.71 NMOSD relapses occurring on rituximab are generally milder than those occurring off treatment. Non-circulating B-cells in lymphoid tissues (ie, most of the total body B-cell population) and long-lived plasma cells are not thought to be depleted by rituximab and may have a role in breakthrough disease. Genetic factors may explain why some patients do not maintain adequate B-cell depletion. These include polymorphisms in the B-cell activating factor gene or in the Fc gamma receptor 3A gene expressed by the effector cells that mediate B-cell killing (figure 3).71 75 Another hypothetical reason might be the development of antidrug antibodies. The efficacy of some monoclonal antibodies is reduced by antidrug antibodies, for example, anti-tumour necrosis factor agents. Fab binding could have a neutralising effect and Fc binding may increase drug clearance. However, the role of anti-drug antibodies in rituximab treatment failure is uncertain. They were identified in a third of patients with MS treated with rituximab.76 They may have a greater effect in patients on low-dose rituximab (100 mg infusions)77 but higher, standard doses probably overcome the effects of antidrug antibodies.76 78 Outside of trials, detection of antidrug antibodies can be technically difficult, poorly standardised and is hard to obtain for routine use. Due to the risk of early relapse after rituximab initiation, some neurologists continue moderate-dose prednisolone (usually 10–20 mg daily) for 4–12 weeks in NMOSD. The decision to continue corticosteroids depends on the condition being treated and individual patient factors. Combination with other immunosuppressive medications can be considered in some circumstances but must be balanced against the risk of immunocompromise. We generally reserve combination therapy for refractory disease. In treating rheumatoid arthritis, rituximab is often combined with methotrexate or leflunomide but there is little evidence to guide practice in neuroinflammatory disease. The efficacy of rituximab and current safety data support its use, and the longer term safety profile will become clearer with increasing use of B-cell-depleting therapies like ocrelizumab. Tables 2 and 3 summarise the approach to adverse events and special prescribing circumstances. Italicised points denote personal practice, rather than established recommendations. The relatively favourable safety profile of rituximab is likely due to preservation of protective antibody production by CD20negative long-lived plasma cells. However, it remains uncertain whether long-term humoral immunity results entirely from these self-sustaining cells or whether replenishment of plasma cells by memory B-cells is required. Several studies have reported secondary antibody deficiency complicating rituximab therapy—a risk that appears to increase with repeated courses and lower pretreatment levels of immunoglobulins.67 78–80 Not all patients with hypogammaglobulinaemia develop infections, but we recently reported a series of serious sinopulmonary infections associated with hypogammaglobulinaemia occurring in patients with NMOSD on long-term rituximab.81 All patients had prior exposure to immunosuppressant medications. This has led to changes in our practice, with greater focus on pretreatment vaccinations, B-cell monitoring to limit cumulative rituximab dose and targeted use of immunoglobulin replacement therapy to mitigate sinopulmonary infections in selected patients (see figure 4, table 3 and Box 1). Rituximab crosses the placenta after 20 weeks’ gestation. Although not known for certain, the existing evidence suggests that rituximab is possibly safe for use during early pregnancy (see table 2).82 The prolonged B-cell-depleting effect (sometimes greater than the 40 weeks of gestation) can be used advantageously. For example, in planned pregnancies, rituximab could be given before conception and after delivery, sparing the gestating fetus from B-cell depletion. Ocrelizumab has been licensed as a fixed six-monthly dosing regimen with no specific immune function monitoring, despite the fact that considerable interindividual variation is observed in time-to-repopulation of B-cells following ocrelizumab.87 The experience of ocrelizumab in clinical trials may seem inconsistent with our and others’ real-world experience of rituximab, in which we have observed the coexistence of secondary antibody deficiency and increased rate of infections in patients with NMOSD on maintenance therapy.78–81 We postulate that this may relate to a degree of baseline immune dysfunction caused by prior immunosuppressive medication and a longer treatment duration than is recorded in the pivotal ocrelizumab studies. This echoes experience in vasculitis, where previous immunosuppressive therapy (particularly cyclophosphamide) has been identified as a risk factor for greater decline in immunoglobulin levels and more prolonged B-cell depletion after rituximab.25 88 In contrast, the vast majority of patients recruited to the MS ocrelizumab trials were treatment naïve or had used non-immunosuppressive disease-modified therapies. Safety information on ocrelizumab from postmarketing surveillance will be useful to further inform risk and to guide whether flexible dosing may become preferable in certain situations. Sequential treatment effects following high-efficacy disease-modified therapies are also yet to be explored. Rituximab is a valuable treatment option for a variety of neuroinflammatory conditions. While there are no randomised controlled trials and questions remain about optimal dosing strategies, there is a growing body of evidence to support its use in specific situations. Overall, rituximab has an excellent safety profile, and relative to other immunomodulatory treatments, it may be an option for managing severe active diseases in pregnancy. However, neurologists need to be aware of specific management issues, including secondary antibody deficiency in patients requiring maintenance B-cell depletion. Specific risk factors to consider include low pretreatment immunoglobulin levels, prior use of immunosuppressive drugs or a requirement for ongoing combination therapy. Newer and more costly B-cell-depleting therapies show additional promise in recent and ongoing trials but it remains to be seen if more effective and prolonged B-cell depletion will pose additional risks. Prospective registries with extended follow-up will be important in better defining the real-life risks and benefits for patients. , 2018. https://bnf.nice.org.uk/drug/rituximab.html [accessed 7th Mar].
. Rituximab in primary angiitis of the CNS (P3.076). Neurology 2017;88.
. Rituximab versus cyclophosphamide in ANCA-associated renal vasculitis. Ann Rheum Dis 2015;74:1178–82. , 2014. Rituximab in combination with glucocorticoids for treating anti-neutrophil cytoplasmic antibody-associated vasculitis. https://www.nice.org.uk/guidance/ta308/chapter/1-Guidance [Accessed 16 Jun 2018]. , 2018. https://www.medicines.org.uk/emc/product/3801/smpc [Accessed 7 Mar 2018].
. Secondary antibody deficiency and infection following B-cell depletion for CNS neuroinflammation. J Neurol 2018;265:1115–22.
. When to initiate immunoglobulin replacement therapy (IGRT) in antibody deficiency: a practical approach. Clin Exp Immunol 2017;188:333–41. , 2011. Department of health clinical guidelines for immunoglobulin use: second edition update. Available from: https://www.gov.uk/government/uploads/system/uploads/attachment_data/file/216671/dh_131107.pdf [Accessed Jul 2011].
. Safety, tolerability, and efficacy of rituximab in the treatment of multiple sclerosis: 285 patients treated in a single center. Neurology 2015;84. Contributors DHW drafted the manuscript and subsequent revisions. All authors critically appraised, revised the manuscript for important intellectual content and approved the final version of the article. AJ conceived and designed the review. Competing interests ECT has received honoraria and support to attend educational meetings from Merck, support to attend educational meetings from Biogen and salary as a UK MS Registry fellow from Biogen. SJ has received advisory board, consulting, meeting attendance, speaker, study, author and project support from CSL Behring, Shire, LFB, Biotest, Binding Site, UCB Pharma, Grifols, Octapharma, SOBI, GSK, Sanofi, BPL, Zarodex, Weatherden and Uptodate. SH has previously received funding from the NIHR Oxford Biomedical Research Centre, the Watney Trust and Myaware. RJM has acted as consultant to, or received support for speaking at or chairing meetings, or received grant funding for research from AKL Pharma, BMS, Cellgene, Chugai, Eli Lilly, Novartis, Pfizer, Roche, Sandoz, Sanofi and UCB Pharma. HJK has received speaking and/or consulting support from Bayer Schering Pharma, Biogen, Celltrion, Eisai, HanAll BioPharma, MedImmune, Merck Serono, Novartis, Sanofi Genzyme, Teva-Handok and UCB; research support from Ministry of Science & ICT, Sanofi Genzyme, Teva-Handok and UCB. He is a steering committee member for MedImmune, and coeditor/associated editor of MS Journal-Experimental, Translational and Clinical, and Journal of Clinical Neurology. NPR has received personal fees and other from Biogen, grants from Novartis, grants and other from Genzyme, Roche and Teva, and personal fees from Merck. BACC has received personal compensation for consulting for AbbVie, Biogen, EMD Serono, GeNeuro, Novartis and Sanofi Genzyme. AJ has received compensation for advisory board, consulting, meeting attendance and speaking from Biogen, Terumo-BCT, Genentech, Shire and Chugai Pharmaceuticals. Provenance and peer review Commissioned; externally peer reviewed by Jackie Palace, Oxford, UK; Neil Scolding, Bristol, UK; and Jon Sussman, Manchester, UK.